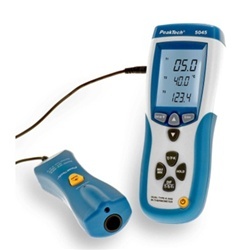 Digital two channel thermometer with two K- type inputs and additional external infrared sensor. Can also be used for measurements at low temperatures. With automatic shut off, maximum value storage and data hold function. Includes case, 2 K-type thermocouple sensors, infrared temperature sensor, 9 V battery and instruction manual.